"The village of Oxford, incorporated April 6, 1808, is located in one of the most charmingly developed farming districts in Chenango County, and lies in a narrow valley closely hemmed in by green rounded hills whose contour clearly betrays the glacial action of past ages. Fields under careful cultivation and meadows on which graze large herds of cattle, with here and there a wood lot, make a picture soft in coloring and one rarely seen." This description, written in 1906, was in the book, "Annals of Oxford, NY", by H. J. Galpin. It's as apt a description of Oxford today as it was nearly a hundred years ago. People have been farming the land in Oxford for centuries. It's never been easy, with its rocks, short (zone 4) growing season, browsing wildlife, stubborn weeds and pests, and some other annoyances, but people stick with it. Why? Maybe it's the lure of the nutrient rich, fertile soil, possibly natural irrigation from underground springs, and plenty of fresh air and sunshine. In addition, the land may have been in the family, they enjoy making things grow, and/or maybe that's just what they do and love best. Generations of people have stayed here because of its beauty, abundant rain fall, and vast acreage. One of the oldest Oxford farms on record, is Corn Hill Farm. Benjamin Butler was born in 1764 (and was one of the founders of St. Paul's Episcopal Church). In 1806, he moved his wife Hannah and their children (originally from CT) to Oxford, NY. After several residences, they settled into what became, "Corn Hill Farm", raising sheep on State Street. Benjamin was also a successful land broker, but not nearly as successful as his sheep production. He had so many sheep, that the hills surrounding Oxford village were covered like a fluffy white blanket! At the age of 75, in 1839, he passed away, and his flocks had to be distributed all over the state. Another very old family farm still in operation, is Marshman Farms, having the honored distinction of being named a "Century Farm"! (One of only four in Chenango County.) Jacob and Arvilla Marshman came from Germany and established their Oxford farm in 1856. For six generations, the Marshmans have actively been involved in the operation of the farm, criteria for the "Century Farm" distinction. 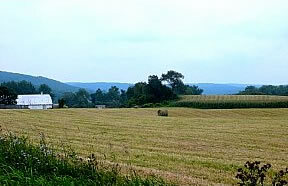 In the summer of 2004, the Chenango County Historical Society presented a program and exhibit celebrating the long tradition of the family farm, and the Marshman's Century Farm was featured. In September, the CCHS program concluded with Robert Marshman as the key speaker, presenting historic photographs and a display of farm-related items. Over their years of operation, the Marshman farm, Tiger Lily, has developed a fine reputation for Holstein breeding. Robert Marshman currently operates this modern and progressive dairy farm with his sons John and David. Located on County Road 32, it's 3 miles South of Oxford Village, with over 650 animals on site, milking over 350 registered holsteins daily.